Judy Thompson, Keynote Speaker English is Stupid, Students are Not. Judy is an internationally recognized TEDx speaker, author and teacher. Her energetic and innovative presentations inform, entertain and empower educators with simple tools for teaching pronunciation. Participants say they love to use on Monday the techniques they learned on Saturday. Margaret Sanderson is the University Accessibility (AODA) Coordinator at Brock University where she coordinates compliance of the Accessibility for Ontarians with Disabilities Act. Margaret holds an M.A. (Planning) and is Co-Chair of the Council of Ontario Universities Accessibility Coordinators sub-group and member of the Reference Group on Persons with Disabilities. 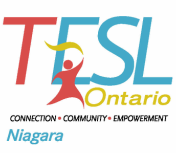 Allison Keown joined TESL Ontario as the Member Services Manager in 2010 and has since expanded the membership benefits of the organization, increased member engagement and improved member communication. Angelica Galante is a PhD Candidate in Language and Literacies Education at OISE-UofT. She currently teaches in the EAP program at Niagara College. Her research interests include plurilingualism, critical literacy, and drama in second language education. Alex MacGregor's teaching career has spanned thirty-­five years and four countries. He is currently curriculum coordinator at Niagara College where he develops materials in his areas of interest: vocabulary, pronunciation, and task-­based learning. Frank Bieri is currently academic coordinator for the EAP Program at Niagara College. He has been teaching English as a Second Language for over 13 years and his specific areas of interest include classroom design innovations, engagement technology, audio/visual tools, software, and new educational technology initiatives.